"The idea was to try to have this talked about in Washington right with an election pending, to give an idea to the next admininstration, whichever it may be, of how to have a space program that accomplishes something within the next president's two-term stay," Zubrin told Space.com. Indeed, getting humans to Mars in the reasonably near future will require an active commitment on the part of politicians, not just vaguely stated support for the idea, Zubrin said. He cited President John F. Kennedy's push to send astronauts to the moon by the end of the 1960s as a model. "Do we get someone who, instead of just saying, 'This is a good idea, and I hope it happens someday and I'm willing to do something towards that goal,' says, 'I'm going to make this happen,' which is what Kennedy said?" he said. 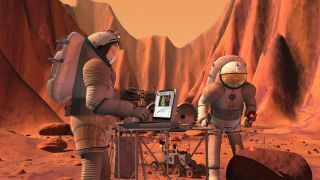 The conference will feature presentations and panel discussions on a number of topics, from the search for life on Mars to technologies that could allow Red Planet settlers to "live off the land." Notable speakers include Jim Green, head of NASA's Planetary Science Division; Jim Watzin, director of the space agency's Mars Exploration Program; and Nicholas Cummings, staff director for the Senate Subcommittee on Space, Science and Competitiveness. Unlike most meetings, the Mars Society Convention will also feature debates — four of them, in fact, about NASA's Asteroid Redirect Mission (do we need it? ), "planetary protection" policy (does it go too far? ), property rights in space and which of the two major presidential candidates has the better space policies. Lamar Smith (R-Texas), chairman of the House of Representatives' Committee on Space, Science and Technology, will argue the pro-Donald Trump side; Donna Edwards (D-Maryland), a member of that same House committee, will put forward Hillary Clinton's case. You can learn more about the meeting — including how to watch webcasts of the plenary talks, panel discussions and debates — at the Mars Society's home page.